If you like a nice sweater that just look amazing then you want to check out this casual top and it comes in 3 color. This women’s top is available in orange, camel, and navy and each has a different other fabric on the bottom to give it the look like you are wearing a shirt under you sweater and that just makes it really nice looking and as it has 3/4 sleeves you even show your arms. You can get this women’s top in sizes XSmall – XL. If you want a fun top for summer then check out this striped off shoulder crop top. The women’s top comes in a white version with black stripes, a red version with white striped, and a pink version with white stripes. All these fun crop tops come in women’s sizes Small – XL and they are made from 100% polyester. A fun crop top like this is easy to combine with some summer shorts or maybe a nice pair of jeans and when it gets cooler then it will look stunning with a fun jacket too. Get your Striped Off Shoulder Crop Top for $4.99 and Free Shipping. This black women’s top is a lot like a t-shirt but has a really cool design. The shirt looks like a normal black t-shirt and it seems to have a lower neckline but it also has a choker build in and that makes this really cool looking. And you could wear this top as a normal shirt or you can knot it up and wear it more like a crop top. 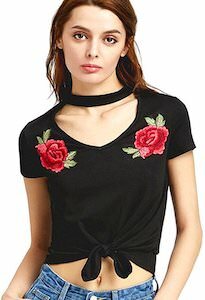 The black t-shirt has two red roses on the front and they are embroidered in the top giving it just the perfect look your want. And this choker top is available in women’s sizes Small – XL. This women’s crop top has a corduroy fabric and a zipper going down the front. A top like this is great to match with so many outfits and the zipper is just a fun and cheeky detail. You can get this t-shirt in colors grey and black and it is available in women’s sizes Small – XL and will quickly become one of your favorite tops. Get your Corduroy Crop Top With Frontal Zipper for $15.99 and Free Shipping. This women’s top is just perfect, it’s nice enough to work as a formal top but fun enough to be perfect for a casual outfit to. The camisole style shirt has red spaghetti straps and is white and of course sleeveless and the lower part of the top has a red crochet part witch give the shirt a real nice look. You can get this fun summery top in women’s sizes Small, Medium and Large. A fun top like this is great to match with many outfit from leather pants to fun jeans or even with some fun summer shorts. This tank top is all about the stars and stripes from the US flag. On this white women’s tank top you can see a butterfly bow witch is decorated with the flag of the USA on it and that makes this v-neck top just perfect for the 4th of July or any other summery day that you like to show you love for the flag and America. You can get this top in women’s sizes XSmall – 2XL and for sure people will notice it as it has the flag on it so clearly and perfect. No need to be to hot this summer because wearing this top will keep you cool. Is Sunday the best day of the week for you? If so then you just need this sweater. This women’s sweatshirt comes in all kind of colors like pink, blue, yellow, black and white and you can see them all by clicking on the pictures. 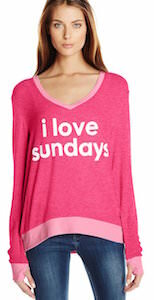 On the sweater it says “i love sundays” in a relaxed print that goes well with the baggy look witch makes it perfect for a lounge day on Sunday. This women’s sweatshirt comes in sizes XSmall – XL and is made in the USA. Can’t choose between plaid or plain? This women’s shirt has you covered. 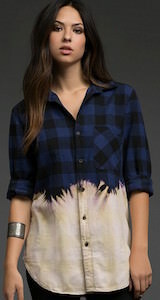 The flannel shirt is dip dyed and that makes the top looks like a blue and black plaid while the bottom is a more plain pink and yellow. You can get this cool looking button down shirt in women’s sizes Small, Medium and Large and people will do a double take when they see you wear it.